Finn-Lasse Streyl, 27 years old from Rickling in Germany. Finn is the driver and owner of the 3.6t / 7930lbs. IH Super Sport Tractor called ,,Mighty Quinn´´. He´s also building parts (Freakshow Performance) for other Pulling Teams in Europe. Finn-Lasse Streyl: I have just graduated in International Master of mech. Engineering and I´m studying Welding Engineering now. Despite that I´m helping other teams with racing parts and technical support (Freakshow Performance). Finn-Lasse Streyl: I´m playing football and I’m always open for a beer or two with friends. Finn-Lasse Streyl: I like the raw horsepower and the crazy technology that is unique in motorsports. I also enjoy making parts and seeing how they perform. Finn-Lasse Streyl: I barely remember, it must have been at the age of 4-5 in Haßmoor in North Germany, I went there with my family. We went there every year. Good times! 😊. Finn-Lasse Streyl: We were pulling in Sdr. Hygum in Denmark for the first time last year and the track was very good, but what really impressed us was how little time was wasted between the pulls, it was just exciting to watch and far from boring. Other than that, I love the Night Pulling in Volkmarst (D) and Grimmen (D). 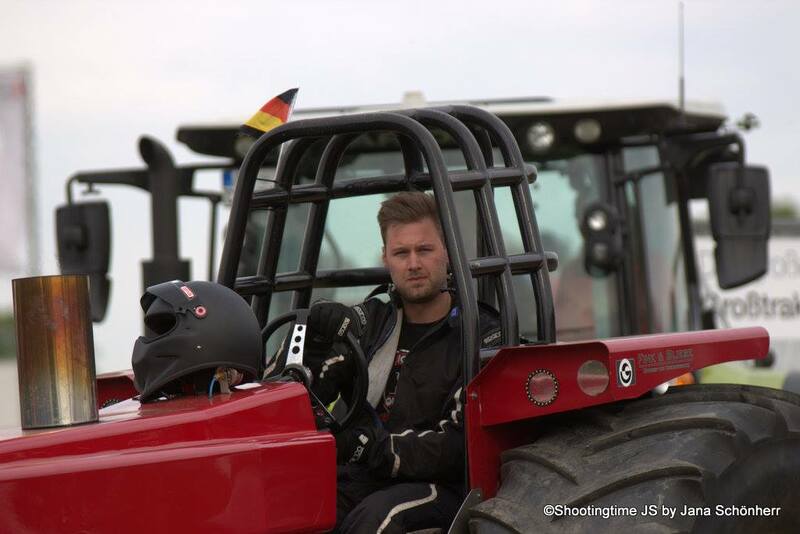 Finn-Lasse Streyl: The first time was at a quite an early age, something around 9, there was a local garden tractor pull that I was participating in with my childhood friend, who still is my teammate today. Finn-Lasse Streyl: In 2015 the day before Grimmen (D) we were working all night to get the tractor ready, borrowed a turbo from a friend’s tractor and blew the oil pump during warm up, we were close to giving up. But we could fix it all and we were winning the next two pulls. That was a nice payback. Finn-Lasse Streyl: I`m a Diesel Head, but also like to watch Super Stocks and unique engine combinations or set ups in the Modified Classes. The new 600 Kg Modified Class is interesting to watch for example. Blowing up turbo after turbo during season 2015 and 2016. That was no fun. Finn-Lasse Streyl: There must be a good stair step system for younger people to get started in this sport not having a lot of money. Finn-Lasse Streyl: Just getting the tractor running stable and testing all those parts that were sitting on the shelf for the last years when we were fixing the other problems. Finn-Lasse Streyl: Starting a 3,6t Super Sport class in Germany, that seems to really have gotten something going. Finn-Lasse Streyl: During last winter there were so many nice projects going on everywhere that I really can´t decide. I like the homemade Dyno of the Hook n´ Run team though. Finn-Lasse Streyl: Thanks to all people who support the sport on and off the track, doing all the paperwork, politics, event management and so on !